23 ESO Quest Dialogue: How much? The named and accessible tombs that are related to certain quests; some of them have a loading screen, while others don't. The 30 named and inaccessible tombs that are relevant for the Ancestral Tombs Hunter achievement. The unnamed and inaccessible tombs that are decribed in the article Online:Unnamed Locations in Vvardenfell#Ancestral Tombs. This may not be the ideal location to discuss, but I didn't really know where else to do so. Anyway, I've stumbled upon, and have been uploading, a lot of Legends art, and adding card art to their card articles has been largely done through a gallery, with short descriptions. I wanted to refine the gallery concept, since getting more art could make these a bit awkward considering layout and descriptions. I tried something different and added pixel size in the description in lieu of a written description such as "cropped version of larger resolution" (see this page for an example). I think this makes it a lot clearer as to what the image actually is, because you can tell from the thumb whether it's cropped or not, and "high(er) resolution" is simply unclear. As most of you probably know, new users are limited in what they can post, as a spam-reduction measure. This has, occasionally, led to issues with new users who want to post things that happen to involve external links on their user pages or large sandbox edits as their first few edits. One or two edits isn't bad, and they can often go to other users to help out, but when it gets to be several in a row, it can be seriously annoying, as one of our new users recently discovered. Because autoconfirmed status is based purely on an algorithm of X days and Y edits (in our case, 4 days and 10 edits), there's nothing administrators can do to override this currently. We can manually do pretty much the same thing, though, by creating a group and granting users access to it as needed until they get their autoconfirmed rights. I'm thinking of simply adding a "Confirmed Users" group that any administrator can add a user to upon request. Given that it really grants no significant rights, we could even give Patrollers the ability to grant this permission if we want, as a way of easing them into the idea of granting rights, should they become administrators later on. This would require a bit of server work, and changing some of our spam filters to match, but it's really not that big of an effort, so I think it's a worthwhile thing to do to make our wiki more welcoming to these users, even if it's not an issue that comes up all that often. Our vandalism page does say "Adding links that advertise a personal Elder Scrolls-related fan site is usually inappropriate, but not necessarily vandalism". While it's a broad statement, in practice, we've never tried to forbid or limit someone from advertising the other things they do. My personal interpretation of it based on what I've seen over the years is that it was intended to cover people who only post an ad link on their page and don't contribute to UESP in any other way. Stemming from a comment on Discord ("we kind of choke the life out of the mod sections since they aren't linked on the sidebar" --AKB), and given that there are so many different versions of the sidebar (depending on which gadgets you've got turned on, or what custom code you have), it's hard to remember really what the default is. So I would like to propose a new default for the sidebar that is based exactly on what is listed at All Content, since that is what I believe the sidebar should reflect. The current sidebar is inconsistent with what it includes (SR and OB add-ons, but not MW ones; TR, BM, and SI, but not DB, etc), while All Content is consistent throughout. I know there were numerous arguments before about KotN/SI and DG/HF/DB, so the proposal here is namespaces - yes, other DLCs - no, exactly the same as All Content. Granted that will make it quite long, but for the benefit of not hiding stuff away, I think that's a reasonable trade-off. We could even make the collapsible feature active by default to make it a bit shorter. All Content should have links to Dawnguard, Hearthfire, and Knights of the Nine because these are some of the largest additions to the game. It's purpose is to provide a directory to the major content portals on the wiki. As for the sidebar, it already has a link to All Content, so in my opinion it should be a more condensed version. That isn't to say the sidebar is perfect right now. I agree with Enodoc that Elder Scrolls Online needs links to Morrowind and DLC. However, for Skyrim the Official Add-Ons page already includes DG, HF, and DB. The same goes for Oblivion's Add-Ons page, which has Knights of the Nine and Shivering Isles. The only reason we have Shivering Isles on the sidebar is because like Tribunal and Bloodmoon, it is a full expansion (ask Legoless). The Morrowind Add-Ons are really too small to justify a link; if not for KotN, we wouldn't have it for Oblivion either. There is also little reason to have all four TES Travels games because the main page already has them in a nice summary. These games are hardly ever played so to have five links is ridiculous. General is also rarely used, so the same argument applies. Keep in mind these are already on All Content (don't forget Canceled Games under General if you want everything). I'm all in favor of grouping Battlespire, Redguard, and Legends under "Spin-Offs". This removes any breaks in continuity for the main series (and Daggerfall is probably played more than Battlespire and Redguard combined). Completely agreed on adding DG, HF and KotN to All Content. If All Content is going to stay in the sidebar, then I agree the whole sidebar itself can be shorter; my suggestion for having the sidebar equal to All Content was to avoid having to click through to All Content in the first place. I'd be fine with wiping off the individual TES Travels entries and just keeping TES Travels itself (that's how the default sidebar works anyway). I do think though that if we're having SR Add-Ons and OB Add-Ons in there, then MW Add-Ons needs to be there too, for completeness. I don't actually know why Canceled Games has its own entry on All Content, since it's just one page of many in General. I intentionally excluded ESOMod because I don't actually know what use it is. You can't mod ESO, and I don't see why we'd ever bother documenting random UI add-ons. But if that's something we're going to do at some point, then yes, it would need to be somewhere. The separate modspace index is a nice idea, but I wonder if that would still leave them hidden too much. If that idea is supported though, I would suggest "Mods" as the page name, as it is simple and easy to understand. (←) The sidebar and All Content are completely separate things with their own necessities and rules regarding inclusion. All Content is seemingly focused purely on namespaces, whereas the sidebar is focused on accessibility for users to find the content they are after. This makes the sidebar much more fluid and often appears in conflict with All Content, specifically in regard DLCs. Cancelled games are a pure exception to the namespace focus of All Content, as without a single page for them all each one would be entered, which is less ideal. ESOMod is about much more than user mods, it contains (or at least should) all public knowledge on the workings of the game, which is useful for modders, only one of the reasons the other modspaces exist. ESO DLC is the DLC that is locked behind additional payments, be that ESO Plus or outright purchase, which includes Thieves Guild and Dark Brotherhood. The fluidity of the sidebar allows Morrowind under ESO, as it did for Dawnguard and Hearthfire when they appeared for Skyrim, and could well have seen links for TG and DB added at the relevant times, even if eventually goes. On my sidebar there are currently no DLC except the general page under Skyrim yet KotN appears under Oblivion. Even if no-one wants to admit it, Dawnguard is a "massive" DLC, where Hearthfire is a "minor" one, as is KotN. The standard DLC for the sidebar should include Dawnguard and Dragonborn and exclude KotN. If we went back and re-evaluated Tribunal, it might likely end up in the Morrowind namespace for the same reasons Dawnguard did not get a namespace, but it would still warrant a place on the sidebar due to its size. KotN usually survives any culls because there is a nice symmetry to having two DLC listed per game, but it really isn't comparable in size to the Dawnguard or Tribunal. The official addons for Skyrim and Oblivion should also be submenus like the Morrowind one which links all the remaining DLC. Due to the fluidity it could even be argued that Legends could be given a more prominent status than relegated to the "other games" section. There is no logic to the suggestion that that section can be split with the spinoffs getting a submenu while the travels are not given the same treatment. We've also had enough arguments trying to confine those seven games under those two headers that are not strictly correct for some of them; leave them at "other games" under the sidebar. (←) The sidebar includes All Content, so the other links should be a useful subset of that page. Keep in mind that All Content still needs an update with links to Dawnguard, Hearthfire, and Knights of the Nine. Hardly anyone plays the TES Travels games, so having five links is not at all useful. I have to side with Silencer on not including Hearthfire based on this usefulness principle. I'm not too concerned if we keep it, but it's really not much bigger than three Oblivion house plugins. Like Silencer said in an earlier post, it also creates a nice symmetry of two major add-ons per game. (←) I find it weird to "hide" Legends in the end of the list as it is the latest Elder Scrolls game, even if it does not belong to the main series. Also I suggest to write names of the games as TES3: Morrowind and TES5: Skyrim, this way we both make a distinction between ESO: Morrowind and TES3: Morrowind and don't have to make an additional line for "Other Games". (←) How about something like this? Another option is creating a new portal for all the spin-off games, and simply adding a link to "Other Games". The gadget version of the sidebar could retain the expanded submenus for the main series games, with links to all of the minor add-ons, and all spin-offs under "Other Games". This discussion has been dead for a while, so I'm going to propose that we make some small changes immediately and figure out more controversial ones in the future. The only changes I wish to make are the following. Elder Scrolls Online DLC (or, to fit with existing naming, Add-Ons). Someone had to bring this issue up and since Morrowind has been out for a while, I figure now is an okay time. The problem, of course, is that this wiki has over 15,000 pages about people in ESO, despite a large percentage of them having no relevance or importance at all. A similar situation exists in TES III with many NPCs having no unique dialogue, related quests, etc. The only difference between them and a generic NPC is their name. Therefore, I propose that NPCs with no unique dialogue, related quests, services, or conversations with others (possibly more things?) should NOT have a page. These links still need to exist, of course, but as redirects to a page listing their names and stats. We can follow TES III's format in almost all cases. I'm quite certain this can be accomplished using a bot. Every page converted into a redirect should get the category Online-Non Relevant NPCs. However, the practical part of how to create and fill the tables is a much bigger concern for me. Adding to this, filling in these small NPC pages is quite quick. And most of the pages are already created. These are the main reasons why I'd support the opposing side right now. When I read the opening post, I pretty much agreed with the proposition of recducing NPC pages and tabulating certain NPC data. This began to change when I read the valid arguments in the opposing posts. Now, after spending quite a few hours of observing "non-relevant" NPCs, I am opposing the idea completely. We should be very cautious about destubbing NPC pages, marking NPCs as having no unique dialoge or categorizing them as being "non-relevant". The amount of (named) NPCs who actually just say "Hello", "Hm", "Yes", "Greetings" etc. is comparatively small. Most of the green, friendly NPCs have a dialogue option and therefore unique dialogue. More than half of the JN NPCs also have a dialogue option, and many of the other JN NPCs have dialogue that comes from a database, but it's far from being randomized – it's a fixed selection of dialogue that follows certain parameters which we still need to understand. Factors are race and occupation, then there are variations which can be described as friendly, annoyed, flirtatious etc. Instead of just calling all these dialogues "non-unique", we should do the uesp thing ... Collect the lines, find out the underlying mechanics and create a page like Skyrim:Guard Dialogue. Also, most NPCs have "schedules". They don't just stand there or walk around randomly or use animation markers indistinctively. Their locations, the groups they gather in, their walking paths, the items they use, the NPCs they observe and talk to – it's all part of their story and the story of their environment. Some NPCs have greetings as the player passes by, some are muttering to themselves, some can be heard shouting to the public from afar. I have observed quite a number of NPCs without unique dialogue suddenly starting a unique conversation with another NPC, and most of them haven't been mentioned in their articles. One of the few scenes that I found documented was the conversation between Climbs Trees and Molwen. It can be assumed that there are many more of these conversations that just haven't been discovered and documented yet. As we have no way of checking the game data for such convos as we had with the CK, this means a lot of in-game double-checking and verifying, keeping in mind that JN NPCs can be killed by other players so that they might not be around for a while. Presenting NPC data in table entries also reduces the chance to actually find the NPCs in the vast ESO cities. If an NPC cannot be found in an interior location and is not a vendor at his stall, the information “can be found in <city name>” is not helpful, it's just not enough. These sentences should be extended so that they specify the location by pointing out a nearby house or city gate – or the NPC's schedule/route. After reading all of these replies, I think it's clear that the term "non-relevant" is unclear, and the task of determining who fits the definition I first proposed may be futile. Since we're obviously keeping all the NPC pages, I agree with Holomay that they need more detail on location and behavior. (←) Well hold on now! I will never in my life support that we should document more of these NPCs than what we already have done. That's going into a detail that is just nonsensical. So, after an inconclusive debate on the Discord server, I'm going to put a vote on here for editors to voice their opinion and to hopefully reach a consensus. Linebreaks are a common feature in ESO dialogue, and a clash recently came about over if linebreaks should be used or not on the Midyear Mayhem quest page. Is that what this crowd is doing? "Indeed! Shortly after we parleyed with your commander, Her Reverence began giving her blessings. It’s quite popular! All the soldiers want double rewards for their efforts on the battlefield." "Indeed! Shortly after we parleyed with your commander, Her Reverence began giving her blessings. It's quite popular! All the soldiers want double rewards for their efforts on the battlefield." The main reason why I want to make this point is that linebreaks are featured in the game files (en.lang), and if, as a wiki, we are to truly catalogue the dialogue that is found in-game, I believe that it would be best to respect the formatting choice that the game uses by featuring the linebreaks, alongside the text and punctuation that is featured too. This is sticking true to what is seen in-game  which I think should take precedence over not including linebreaks for the sake of making the articles seen as more compact with less lines, and because of this, I think that the linebreaks should be consistently included in our articles which quote dialogue. In addition, discussion on the Discord found that linebreaks were often used instead of commas and were commonly featured to separate points being made by the NPC. Regardless of qualms over the potential lack of commas that could have been used instead, the linebreaks serve a purpose to make it easier to read and understand for the player, so it is not a worthless or trivial aspect in that sense, and I believe this can very much be reflected on our wiki pages. Furthermore, by omitting the linebreak in favor of a space, then as a reader we would never know if there was originally a linebreak at all, whereas if we were to record the dialogue with the linebreaks as shown in the files and in-game, then it is clear where linebreaks have been used. "Murder! My friends are already dead, but the watch doesn't care. What's one less beggar? We're nothing to them. But if someone found the killer...."
"Start in the trade district alleys. That's where Old Gianne was murdered just yesterday. Maybe Lieutenant Dubois will give you a reward if you do his job for him." Whilst dialogue is featured on some ESO pages already, I find it often to be incomplete and not filled in from the en.lang files. I believe that coming out of this with a concrete policy on if linebreaks should be used or not would be better for editors to understand contrary to a case-by-case basis, and hopefully avoid future conflicts from editors who have differing thoughts, but if there was a page where the dialogue would somehow seem incompatible with featuring linebreaks, then that can be discussed between the editors and staff to settle a possible exception. 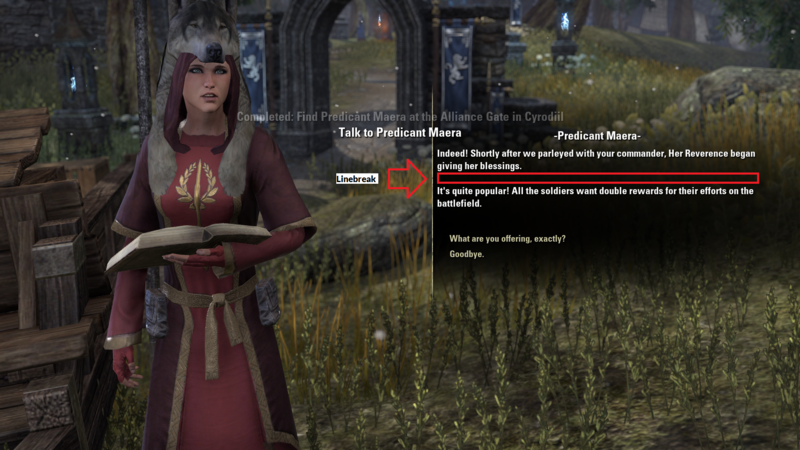 Before large quantities of ESO dialogue are recorded on the wiki, I believe it is also important to overcome this issue before too many articles have dialogue sections that need amending. (edit conflict) Personally I generally prefer the dialogue in-line, for ease of presentation over accurate recreation of the in-game formatting. This is easier to apply to any dialogue format, whether that be the conversation approach or the prose approach, whereas broken dialogue, particularly in prose, would look very odd. I think linear dialogue also flows better conversationally, as your eyes don't have to keep dropping lines, and on narrow screens the number of line breaks could very quickly result in numerous part-length lines, unnecessarily extending the page. NPC line 2 including the break." Thanks for the feedback, everyone. I'm going to rename the project to ONQP, and I'll also find a ribbon! As for images, that is one thing that I did forget to add, which I realised later on when I wrote a page. Have you noticed any change in the ads in the past 2 months? Have you seen any ads with inappropriate content? Have you encountered any auto-playing or auto-scrolling ads? Evening. I think adding the MultiUpload Extension would benefit UESP by being able to upload multiple files at the same time. This would be especially useful for us users fleshing out ESO NPC pages, where we'll often be uploading multiple images for multiple pages that retain the same categories and copyright information. Uploading Clockwork City loadscreens was a bit tedious earlier due to uploading them manually. The recent spate of vandalism, the discussions about it, and about confirmed users, had me thinking about protection of the site, which side-tracked into semi-protection. Semi-Protection protects pages against edits by any non-confirmed user, that is anons and brand-new accounts. However, some of you may remember the further back discussions where it was found that the vast majority of spamming accounts had been auto-confirmed via email. This isn't a huge problem, except that we use semi-protection to guard our most vulnerable templates and pages (i.e. the ones that either break the wiki if messed around with, or our "front" pages. As a technical exercise I asked Robin if another level of protection was possible. He confirmed that it was, and also suggested that it be a "user right" along the lines of blocking, so it could easily be added to any user group (admin of course, patroller, autopatrolled, etc) and that a new user group could easily be set up for those who are good at template writing but don't qualify for any other user groups (a good idea). There is a chasm between the 1334 semi-protected pages and the 25 fully-protected pages (and 4 files) on the site. This new level of protection would help to bridge that gap, providing extra protection to those few templates and pages that require heavy protection but also need to be open to editing. Also, unlike full-protection, which is limited to 19 accounts including the abuse filter, the Portuguese AF, and mediawiki's sysop, this new level could be open to any account (given the right), not just Patrollers, User Patrollers, etc, there would be a lot of people able to edit the pages, but all of them trusted. This is especially important if no action can be taken to limit the ability of spam accounts to become confirmed users. I can see this level slotting neatly between our existing two levels at just "Protected", where "Semi-Protected" is less than normal, and "Full-Protection" is more than normal. If a new user group was set up (probably needs to be as template writing is a rare skill), I suggest it be set up like User Patroller and Blocker, where someone just needs to ask, and an admin give it to them if they agree. It should also be safe to give the right to all our user-groups safely (User Patroller, Autopatrolled, and up). The protection level is to keep them safe from deliberate harm, so it should be apparent if the applicant is suitable. Audio files: Some people probably have seen the uploads of Legends audio files. In the next couple of weeks/months we will add these files to each card page were you can listen to the ‘enter play’ and ‘attack’ audio of the cards. Here is an example page on the content3 server: Content3 server (use show preview if the audio player doesn’t show up). Daveh will install the TimedMediaHandler extension to the wiki if there are no further complications, which allows the use of the audio player on the normal server. Story lines: We will try to get all story line pages (in particular The Fall of the Dark Brotherhood) up-to-date before the new expansion is released. This means that Quest Headers are added and enemy decklists will be verified and updated. Spoiler list: With the new expansion, there will be new cards spoiled. We’ll try our best to keep this as much up-to-date as possible (we are already falling behind though) and maybe we’ll see a UESP exclusive surprise. Re-uploading card images: Some cards do have buff/nerfs or other modifications while we still use the old card image on the wiki. However, this is something that would be better to postpone till after the expansion. There might be some big changes to cards during the expansion patch. There is also the promise from the devs that they will upload high quality card images to their own site, but this could still be months away. Deckbuilder: When Daveh has time after all the stuff he needs to finish first (ESO Clockwork City, TimedMediaHandler, baby, etc.) he might take a look at a possible Legends Deckbuilder in the same vein as the ESO Builder. I started this topic on Template talk:Cite Book and added it to active discussions here, but either no one saw it or everyone silently agrees (it's been over three weeks). Rather than make the change with only TheRealLurlock's support, I want to get some consensus because the change affects most lore pages. Right now, we have two similar templates: Cite Book and Book Link. The only difference in content is that Book Link includes the saved description along with title and author, whereas Cite Book has just title and author. However, the italics for Cite Book are opposite that of Book Link. To fit with the italics style of most of the wiki, we should be italicizing book titles and not authors. This is also consistent with typical use of italics. "Here's the secret: in the end, all these rules are arbitrary anyway, and different style guides have developed their own nuances for what should and shouldn't be italicized or put in quotation marks. If you're writing something formal, remember to double-check your style guide to make sure you're following their guidelines. Remember, though, that ultimately, the only purpose for these rules is to help the reader understand what the writer is trying to communicate. Do you italicize book titles? Whatever you're writing, whether it's a dissertation or a tweet, be clear and consistent in the way you indicate titles." Yes, I agree that the style is completely arbitrary. I don't really care that much which style is used (I would still prefer italicizing books over authors though). However, I don't really understand why we shouldn't be consistent between Cite book and Book Link? Cite Book will not lose any clarity when changed to be consistent with Book Link. It could even be argued to make authors bold to have them stand out more in the lists. I was going to make the change with no strictly opposing comments, but now I'm not sure that would be acceptable. Jimeee, I don't understand what context has to do with italicizing book titles. Almost every page on the wiki I've seen italicizes book titles, except for instances of the Cite Book template, which does it reversed. The context of the Cite Book template is lorespace and italicized book titles are present throughout the actual content there. More important than any consistency, this is a grammar issue. There's no reason whatsoever to italicize an author just because it's an author. There is an argument to be made about leaving italics off book titles, but since we italicize them everywhere else (as most style guides recommend), we should simply flip the italics. After some testing and discussion on Discord, we narrowed down to a specific version of Chrome: 61.0.3163.100. This version is only 2 months old, so it's surprising that it doesn't work. I can update, obviously, but until we know how many other people might be affected by this, I think I'm going to keep this version around for testing, because it might not be just me. How do these look? These are the only things the center class seems to add, as far as I can see, so play around with them and see if you can get things to appear or disappear and narrow it down. As brought up in Discord, we don't really need the "Chatroom" link anymore at this point: the IRC is fairly inactive and hasn't been moderated for probably about a year, and we don't really need to have it there as if it's one of our main features anymore, so shall we just remove it? There was also question as to whether the Discord link in the sidebar should point at the Discord itself (as it does now) or to our Discord page on the wiki. I think it's fine as-is; I think the link itself probably brings more people than putting an extra page/click in their way, and besides we have a link to the wiki page at the top of every page in the form of the "chat" link. My belief is that the "Discord" link should point to our Discord, and the "Chatroom" link should point to UESPWiki:Discord. This is because people who already know what Discord is will simply need an invite to our server, whereas people who have never heard of the program will need to learn how it works first. ESO Quest Dialogue: How much? This is a discussion that has been going back and forth on Discord for a while without reaching much of a conclusion. The main point of contention is how much dialogue should be included in walkthroughs. On the one hand, the style guide says "Key quest-related dialogue should be quoted as part of the walkthrough. In particular, if there is information from an in-game dialogue that would otherwise need to be paraphrased as part of the walkthrough, it is generally preferable to quote the dialogue instead of paraphrasing it. However, the walkthrough should not attempt to include every piece of dialogue that you hear during the quest." The Online Quest Project, however, says "In ESO, there are generally a few paragraphs of dialogue that must be gone through to advance the quest. While there is often other optional dialogue that can be read afterwards, only the dialogue needed to advance the quest should be detailed." The debate has been whether all the dialogue needed to advance the quest is considered "key" dialogue, and whether including all dialogue needed to advance the quest buries the rest of the walkthrough. Obviously we don't want pages to just be dialogue dumps like To The Clockwork City. But should the dialogue in A Faded Flower (formatting issues aside) not be added at all? I think that it's both necessary to advance the quest, and is actually interesting, and that by paraphrasing, you lose most of the actual story. I also think that it's essential to note that you need to Intimidate or Bribe the Nord - the original walkthrough just said "After some convincing", you could get info from him. I think the baseline should be to follow the same layout as used in other namespaces. Dialogue that is essential and noteworthy should be there, but most other dialogue shouldn't. Take Bleak Falls Barrow, for example. That page includes important exchanges between you and Arvel, as well as the theatre scene with Farengar and Delphine, but doesn't have all the dialogue between you and Balgruuf/Farengar at either end of the quest. With the specific example here of A Faded Flower, I would say most of that dialogue is unnecessary for the quest page, as it doesn't help advance the quest. (Advancing the quest is, after all, why someone would be reading the walkthrough.) I agree that the Intimidate or Bribe stuff is important, as that is part of advancing the quest, but I don't think the full dialogue from Velsa is necessary. It doesn't add anything specific to the quest, and therefore just repeats the exact same stuff that should be on Velsa's own page (but isn't yet).